restaurant owner, Xiu Di Yang at No. 57 Village, Corentyne. Detectives have received information that the individual, who appears to be the eldest gang member, took his accomplices by vehicle to the scene of the robbery. Indications are that investigators are making significant progress, even as they continue to question a suspect who was taken into custody on Monday. The detained man is said to fit the description that the victim’s husband gave police of one of the intruders. Police believe that the intruders’ sole intention was to rob the family, but that the robber with the gun panicked and shot Xiu Di Yang when she screamed. From the way they operated, it is believed that the intruders are either in their late teens or early twenties. The 49-year-old owner of the Gin LI Lai Restaurant was shot around 19.50 hrs, allegedly by one of two unmasked men who had gained entry to the restaurant via an open back door. The attack reportedly occurred shortly after the woman, her husband Xu Hue Su, 51, and sons Zhuo Xing Su, 24, and a 14-year-old sibling, Zhuo Su, had finished dinner. Police said that Xiu Di Yang, her husband and two sons were in their restaurant, which was closed for business at the time, when two men, one of whom had a firearm, entered through an open door in an apparent robbery attempt. The husband and the two children fled and raised an alarm. At this stage the armed man discharged a round that struck Xiu Di Yang to her head. The intruders then escaped. 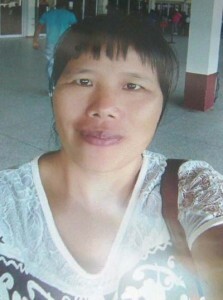 Xiu Di Yang was taken to the Skeldon Hospital where she was pronounced dead on arrival. Zhuo Su, one of the victim’s sons, said that the family had closed the business around 19:50 hrs, since it was the eve of the Chinese New Year. He said that the family had just finished dinner when they heard a noise in the kitchen. He was sitting facing the kitchen when he saw someone standing by the doorway that separates the restaurant from the kitchen. According to the son, the intruder signaled to him to be quiet. But the young man said he made a gesture and his family members turned and saw the stranger and another accomplice. The bandits were unmasked; one carried a small handgun and the other a cutlass. He said that his mother began screaming. He said that his father was holding a chair trying to protect his mother, but as she continued to scream, the gunman shot her in the centre of her forehead. The son said that his father was able to open the front door and flee with his sons from the restaurant. They then scaled the fence, before reaching the roadway, where they began to scream for help. The bandits reportedly made good their escape through the back door. They took a box which contained cigarettes, pens, books and other items of little value.